Have finally solved the problem of FireCapture crashing after capturing anything more than 750 frames of video. Had to reformat the external HDD that I use to capture video for stacking to exFAT format to allow files greater than 4GB in size. These pictures are final images of 1500 – 2000 frame videos that were about 10 GB in size. Best 10% stacked and drizzled. Eratosthenes and the Sinus Aestuum (L79) in the Southeast passing along the Apennine range (L4) to the Caucasus range then finally Aristoteles at top right. Archimedes (L27) is the large central crater. In the centre is a long gash in the lunar Alpes – the Alpine Valley (L19). Plato is the large round crater to the left of the valley. Cassini is the round crater with two small sub-craters like unequal eyes. Best 10% stack of 1500 frames in AutoStakkert!2 – Drizzled. Deslandres, Purbach, Arzachel, Alphonsus, Ptolemaeus. Best 7% stack of 1500 frames in AutoStakkert2! 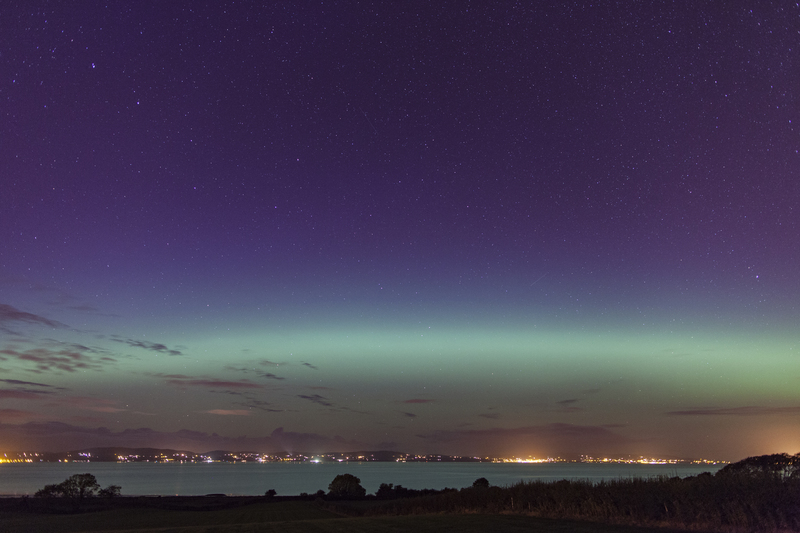 Most of my aurora images have been looking over the Foyle Estuary towards Donegal with some light pollution from the towns on the East coast of Donegal. Downhill beach is about 20 minutes drive from my home but has a clear Northern horizon looking over the Atlantic Ocean with Donegal only to the West and Portstewart to the East. The lovely Mussenden temple is on a nearby hill looking East. 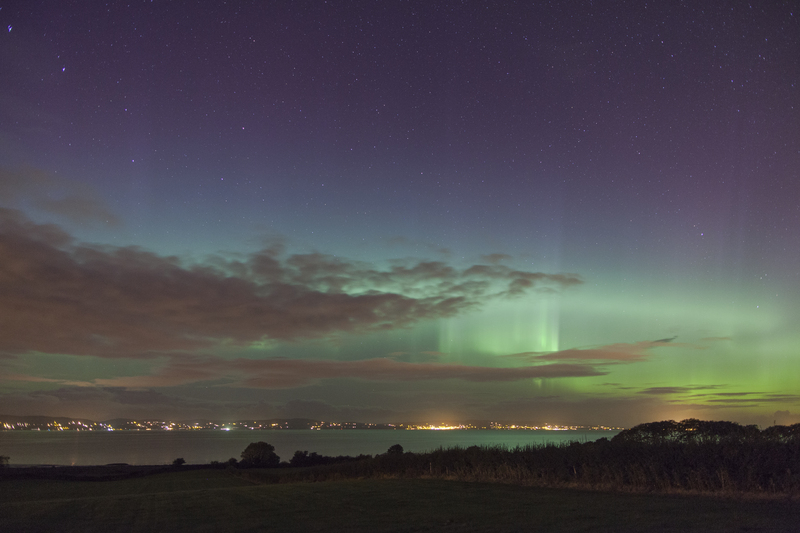 I hope to visit here again for aurora and NLC imaging. 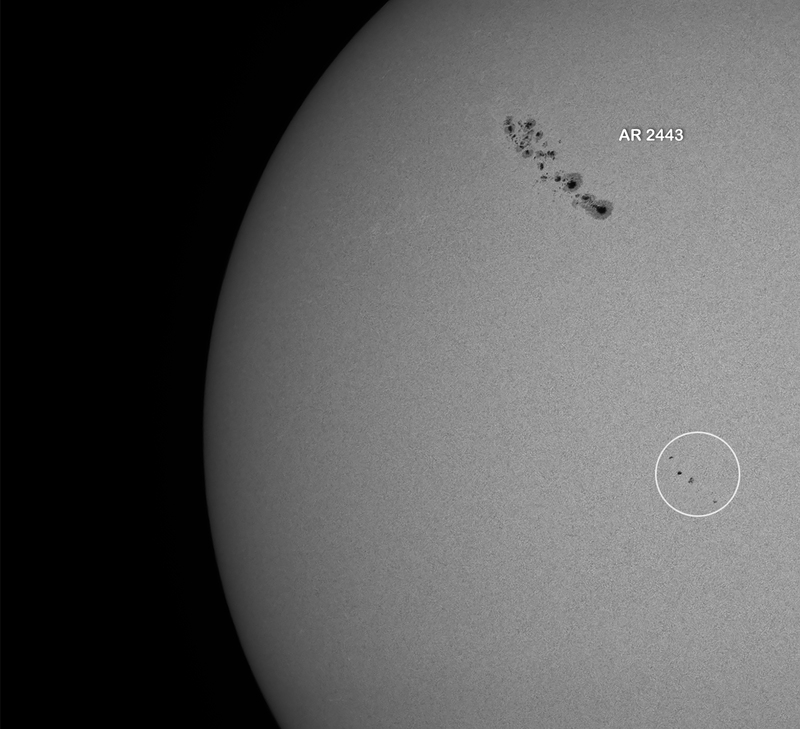 Sunspot group AR 2443 produced a M class flare with accompanying CME 2 days ago which hit Earth tonight. 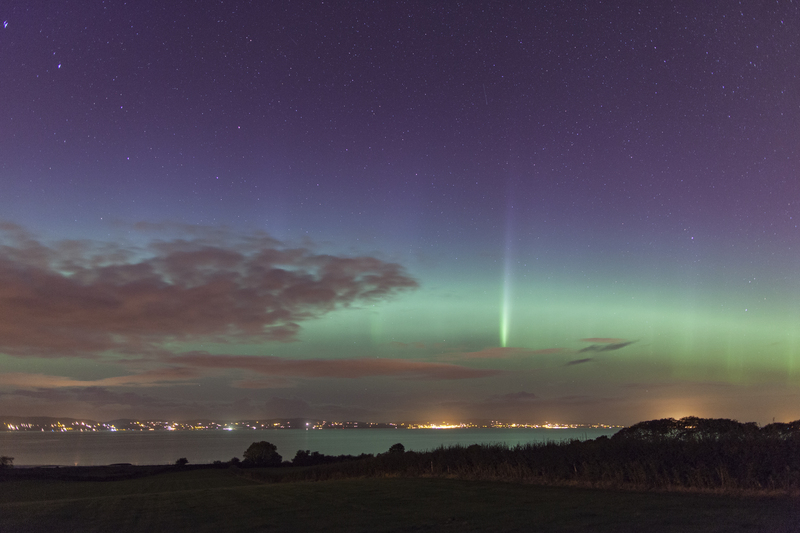 Not an intense hit and I only caught the tail-end of the auroral activity but Im so pleased to have pictures of both the sunspots and the aurora. Also, my first use in anger of my new Canon 6D which was bought specifically for night time work (bigger pixels and less noisy than my Canon 5D2) as well as a Samyang 24mm f/1.4 lens at f/2. 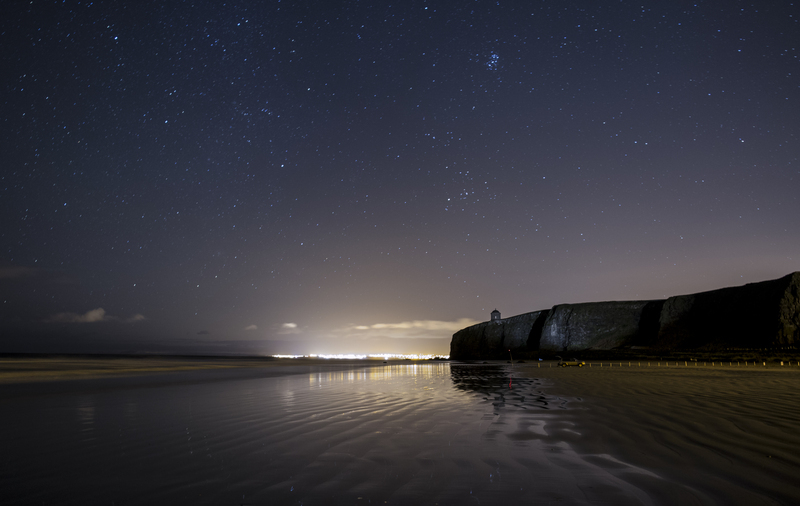 I love my Canon 24mm f/1.4 L II but it does produce some awful coma artefact at night! Im quite pleased with the roundness of the stars in this uncropped photo. Im sorry for not posting for so long. 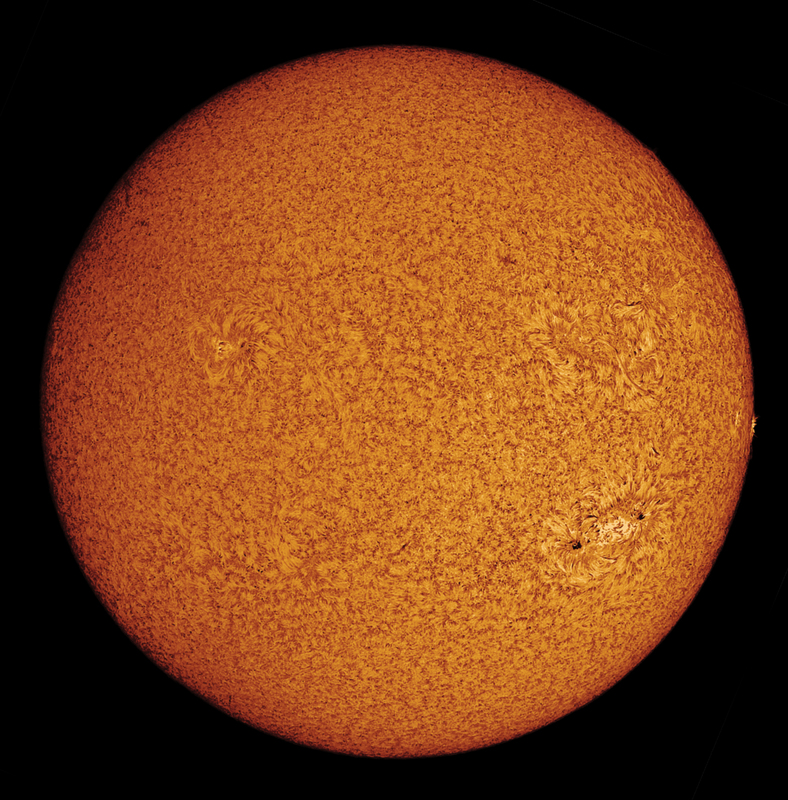 Earlier this year, I upgraded a lot of kit – I got a new CCD camera, the highly recommended Point Grey Research Grasshopper 3 camera, FireCapture 2.4 acquisition software and the Quark Chromosphere Hydrogen alpha filter set. 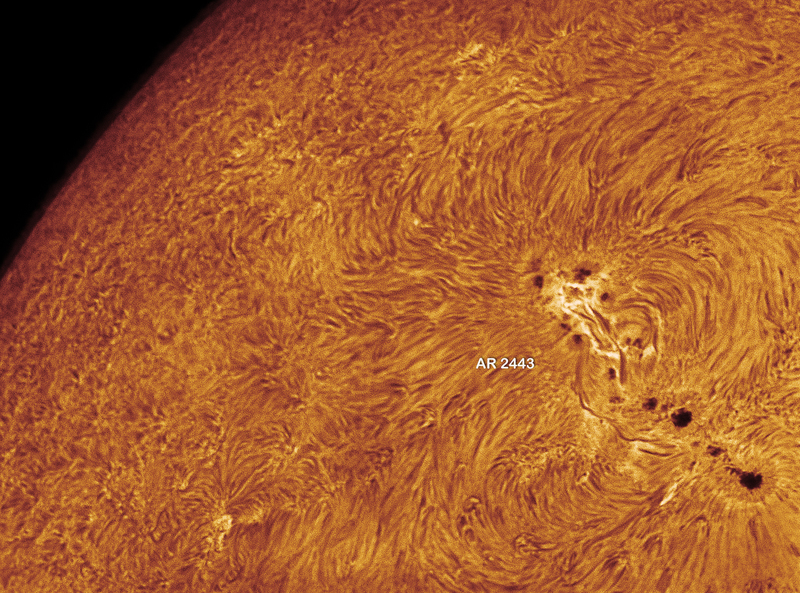 To be honest, Ive had a lot of problems integrating all this into my workflow for solar imaging. Ive just about got this sorted – I found that I could only record about 750 frames of video on the PGR/FireCapture setup due to a limitation on my external HDD so that only a 4 GB file could be recorded. 4 GB on the PGR Grasshopper 3 is only about 30 seconds/750 frames of a 16 bit 1900 x 1200 video. Ive only just worked out that I need to reformat my external HDD to accept files > 4GB size. The Quark was also a little bit tricky to set up – the H alpha images in this post were recorded at 2 clicks to the right on the filter band pass. Hopefully, Ive now got a workflow as follows – start with white light using the Baader Herschel wedge to locate the Sun – use Barlow if required. Change over to Quark, start acquisition at 2 clicks to the right. 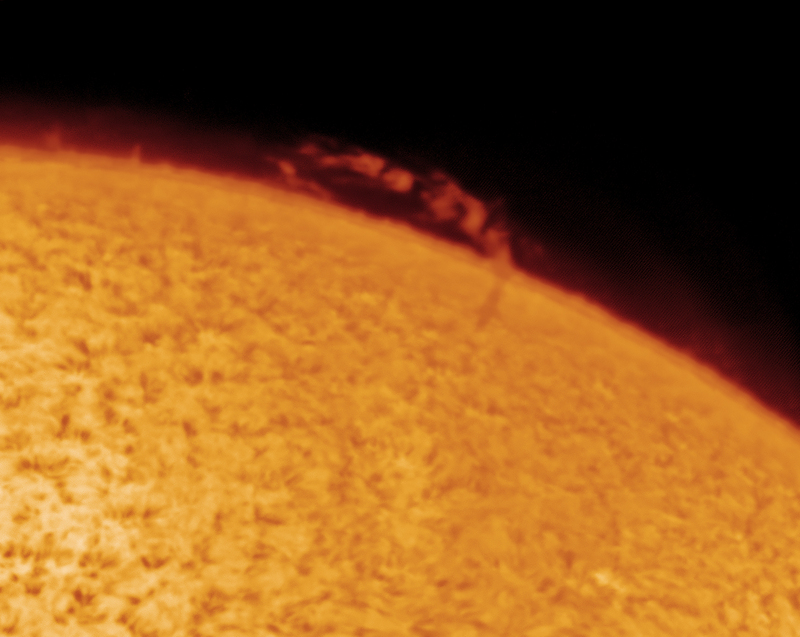 The settings for prominences and the main solar disc in HA are as given above. It looks as through my Equinox 120 ED, although a super white light and hydrogen alpha scope cant focus Calcium K UV light that well so I will change over to my old Celestron 1000/102mm refractor plus Lunt Cak B1200 wedge for CaK imaging. Kp = 6, University of Lancaster magnetometer = 109nT deviation from mean. Expansion phase on Norwegian line magnetometer stackplots. Source: Coronal hole with high speed solar wind. I arrived to find the aurora already in progress. Focused quickly then started imaging. 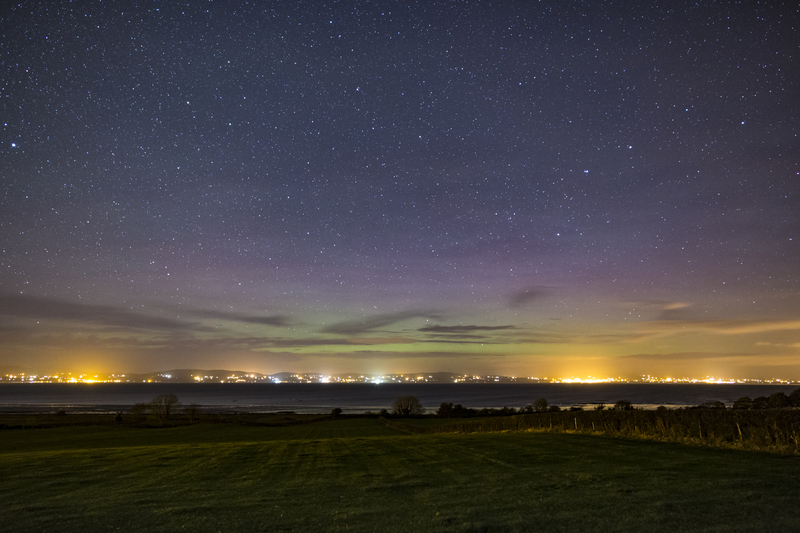 I usually take shots at about 10 -15 seconds ISO 1600 but had to go down to 6 – 8 seconds as the aurora got brighter. 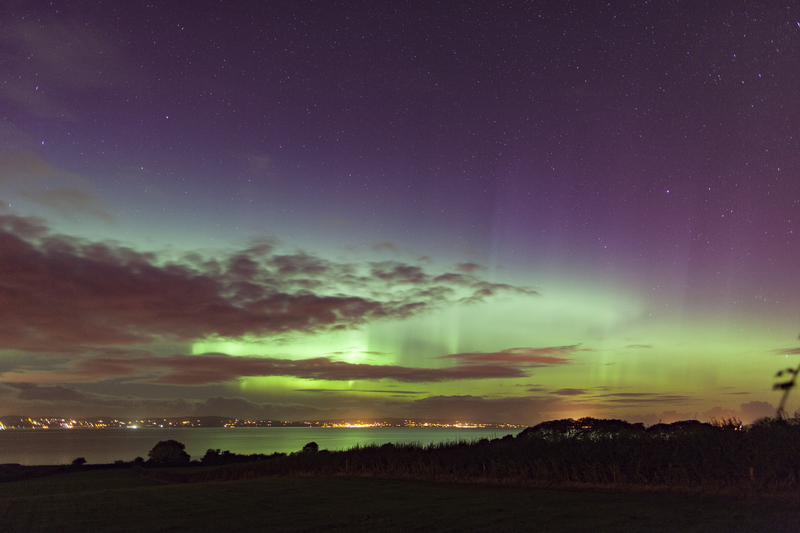 This was the brightest and most complex aurora I have seen to date. It started with a homogeneous arc – a bright uniform curved band and then, one single incredibly bright ray shone down. After a while this split into two then many parts. Rays began to dance around at incredible speed. Finally, for me, very bright patches appeared but by this time the clouds had moved in significantly – in fact, all of the above images were taken against encroaching cloud and I had to angle more and more rightwards to avoid the cloud during the evening. 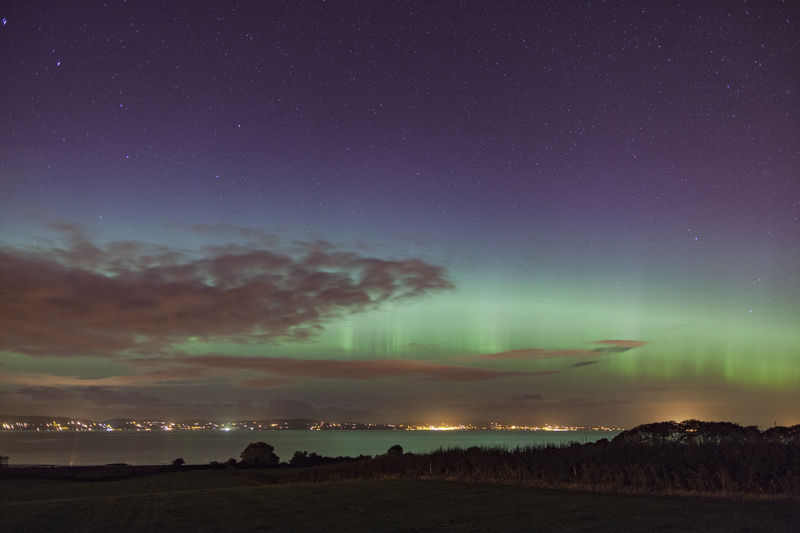 Usually, in Northern Ireland, the aurora is only seen as grayness but once this got going, it was clearly green. 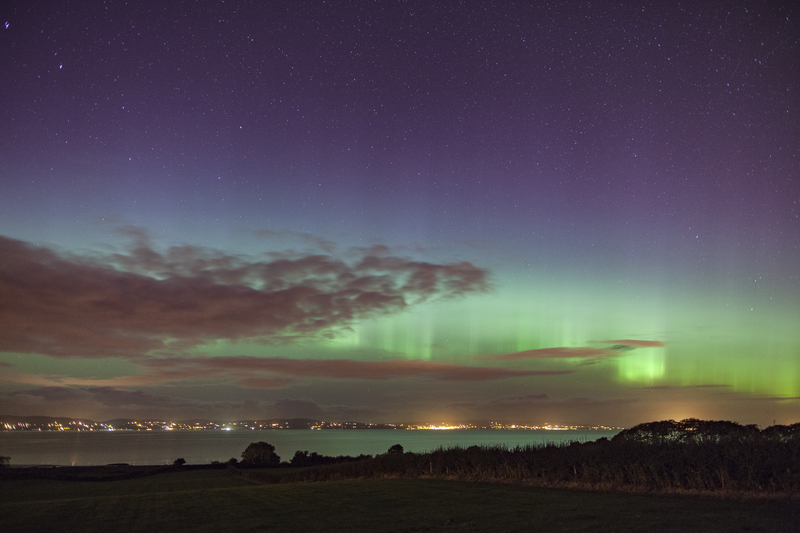 It certainly inspired me to find out more about auroral forms and Ive started to look at the Norwegian line magnetometer stackplots which give a little bit of warning when an aurora starts to move from the diffuse Growth phase to the discrete Expansion phase. Im also strongly considering upgrading my old and trusty Canon 5D mark 2 camera – surprisingly not to a 5D mark 3 but to a Canon 6D – the 6D is a full frame camera but has slightly fewer pixels than the 5D3 – this means they are bigger than in the 5D3 and bigger means less noisy!! Most astrophotographers rate the 6D over the 5D3 because of this. Canon 5D2 with 24mm f/1.4L lens at f/2.2. Am having difficulty setting up my Quark Chromosphere so went back to my old Celestron 102/1000 mm refractor with solarscope filters for the hydrogen alpha shot. The white light shot was taken as a single video with a less magnified 80/480mm refractor. 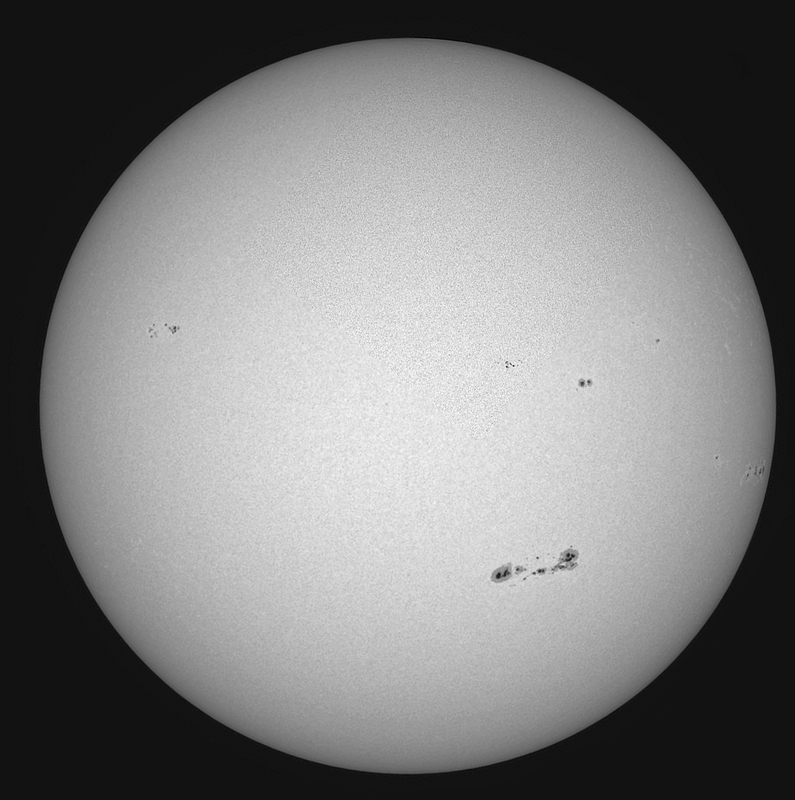 I think I need a long sunny morning when I can set up my 120/900mm Equinox ED for qhite light so as I can get tracking set then swop in the Quark chromosphere. I will also go back to my Skyris 274m CCD camera until I can get the settings on the Quark right. Northern Ireland has been enjoying some good weather! 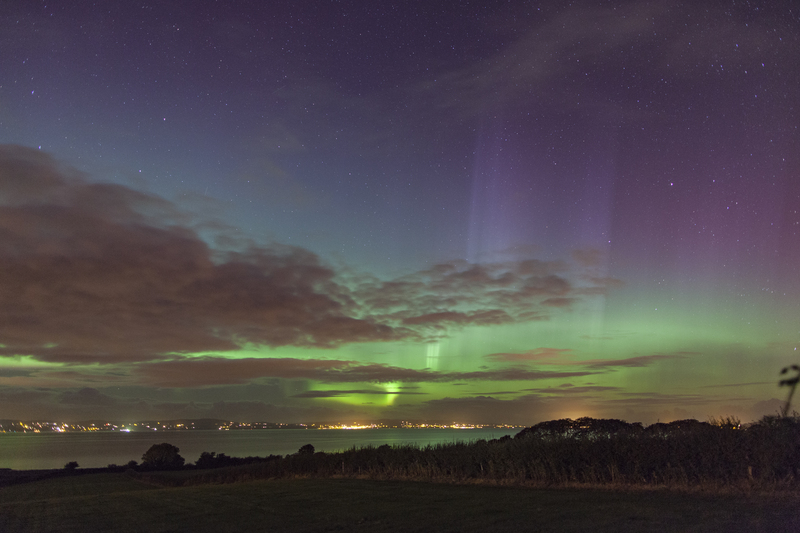 The night started a bit hazy but it gradually cleared nicely. 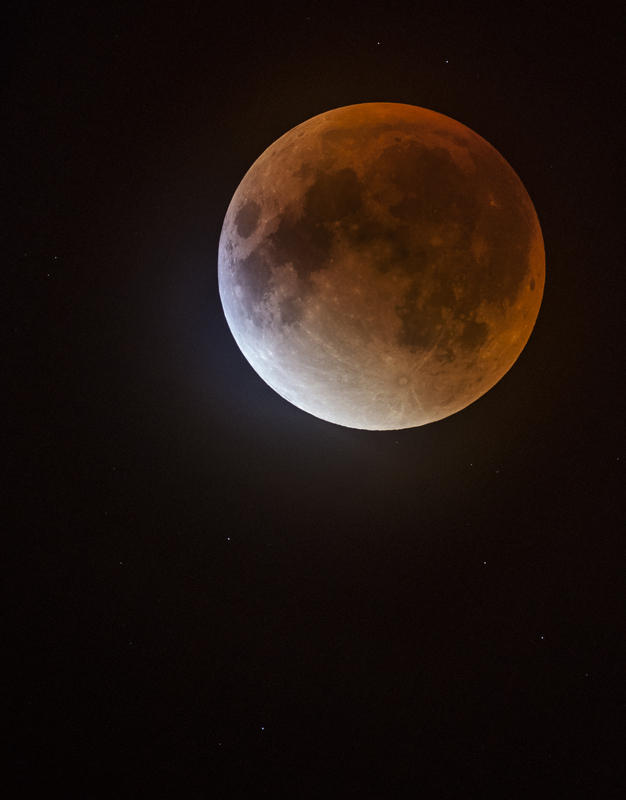 I knew that at 1am to 347am BST I would need to image from my front garden which is very light polluted from street lights but I thought that for a full Moon, that wouldn’t matter too much. I set up my Equinox 900mm f/7.5 scope on a tracking mount (Ioptron ZEQ25GT) and did a very rough polar alignment. I attached a Canon 5D2 to the scope with a large bore T2 adapter. I knew that the Moon would occupy about a third of the frame. Initially I tried using Backyard EOS to control and focus the scope but it only works for long exposures and I had to abandon that and just use live view to focus and inspection of histograms and images to judge exposures. 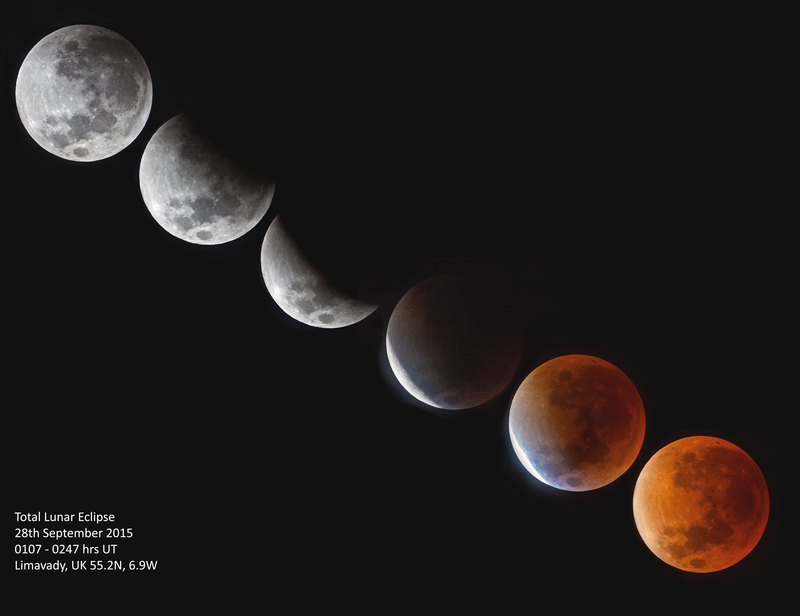 I started off at ISO 100 and 1/250s and gradually, over the course of the eclipse pushed that up to ISO 2000 and 2 second exposures as the Moon got dimmer. 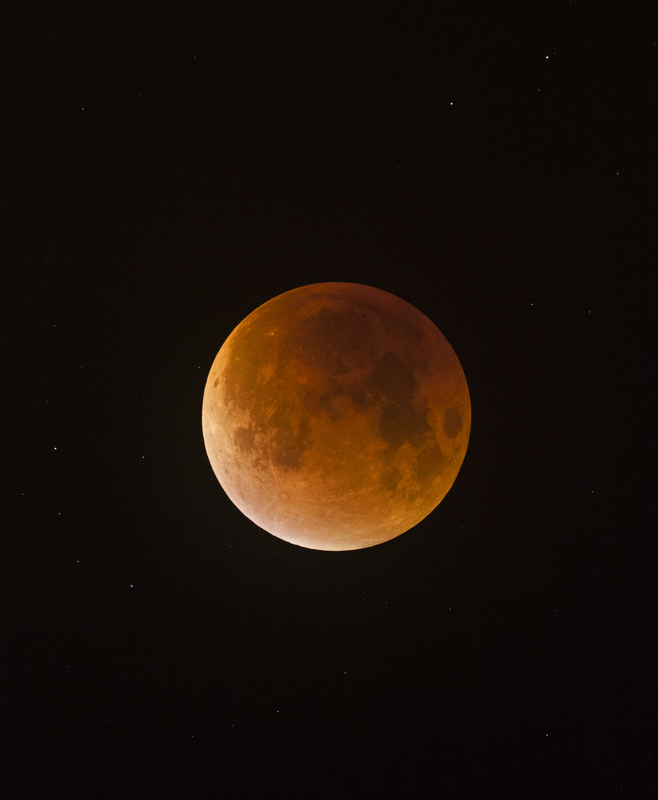 With the tracking mount, I didnt have to worry about the Moon’s movement or long exposure times causing blurring. Overall, I got some lovely images. My next door neighbour, Walter, came out near totality to watch along with me. It was strange how it went from a brightly moonlit night with few stars visible to a dark starry night! The red colour is due to refraction of light through Earth’s dusty lower atmosphere but in image number 5 of the montage, you can see a bluish colour – this is due to refraction of light through ozone at the top of Earth’s stratosphere. One of those evenings when everything worked well.